At least nine Palestinians died Monday after the Israeli army destroyed a tunnel from within the Israeli territory. Seven were reported killed in the operation while two others died during the evacuation operation, Israeli reports say. Four of the dead according the Hamas-run health ministry were members of Islamic Jihad and the rest from Hamas. Several other fighters of both groups were also injured in the operation, which was carried out from Israel, near the fence with Gaza. The Israeli defense military said the tunnel was built from the Gazan city of Khan Younis and crossed into Israel to stop nearly 2 km from Israeli settlement community of Kibbutz Kissufim. Israel blames the Islamic Jihad for building the tunnel which the military said had been under surveillance for a long period of time. 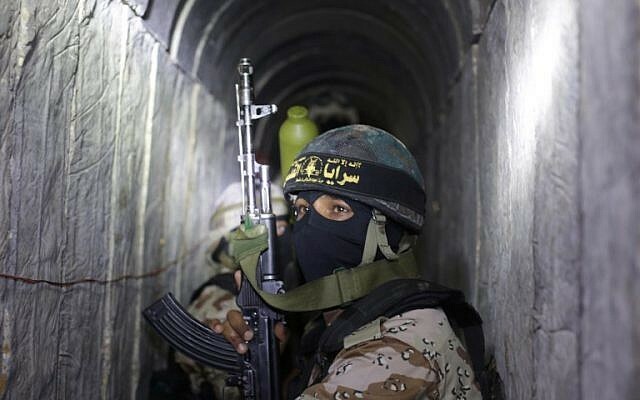 The tunnels issue was one of the bones of contention between Israel and Hamas during the 2014 conflict, although the tunnels stretching into Israel were rare. Hamas and the Islamic Jihad pledged revenge accusing Israel of threatening unity between Palestinian factions. “This latest Zionist crime is a dangerous escalation against our people and its resistance. It is aimed at undermining its steadfastness and unity, and it is a desperate attempt to sabotage efforts to restore Palestinian unity and maintain the state of division,” Hamas said in a statement. Israeli Prime Minister Benjamin Netanyahu hailed the operation and paid tribute to his country’s tunnel discovery ‘breakthrough technology’. Posted by KanelkaTagba on Oct 31 2017. Filed under Headlines, World News. You can follow any responses to this entry through the RSS 2.0. Both comments and pings are currently closed.